Ensure a clean makeup application with the beautyblender Solid Chill Swill Blender Cleanser, a special cleaning kit formulated especially for use with beautyblender sponges. 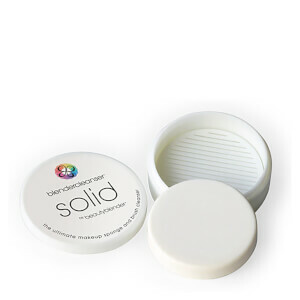 Showcasing a design inspired by the ocean, the solid cleanser expertly removes dirt, oils and product build-up from your makeup tools, providing protection against up to 99.7% of germs. The accompanying pink silicone pad uses a textured surface to help the cleanser penetrate inside the sponges for a thorough deep clean. Free from sulphates, parabens and phthalates. Step 1: Swirl and compress sponge onto soap, working into a lather. Pressing the sponge releases oxygen allowing blendercleanser solid in. Step 2: Bounce the blender against the silicone pad, drawing the soap in and easing the makeup out. And of course, you can use the silicone pad to cleanse makeup brushes as well. Gently squeeze beautyblender or makeup brushes and rinse again to remove any excess cleanser and water. Squeeze away excess water with a towel. Step 3: Set beautyblender out to dry completely in a clean, well-ventilated area and re-use. beautyblenders need light and air to avoid growing mould. Wet sponges should never be stored in a ziploc bag, a drawer, or any closed space. Use the lid of your canister as a drying pedestal, and set your damp blender on it. Allow the blendercleanser solid to dry on the silicone pad. Sodium Palmate, Sodium Palm Kernelate, Water (Aqua), Glycerin, Sorbitol, Palm Kernel Acid, Fragrance (Parfum), Sodium Chloride, Tetrasodium EDTA, Tetrasodium Etidronate, Titanium Dioxide (CI 77891), Chromium Hydroxide Green (CI 77289), Aloe Barbadensis Leaf Juice, Maltodextrin.